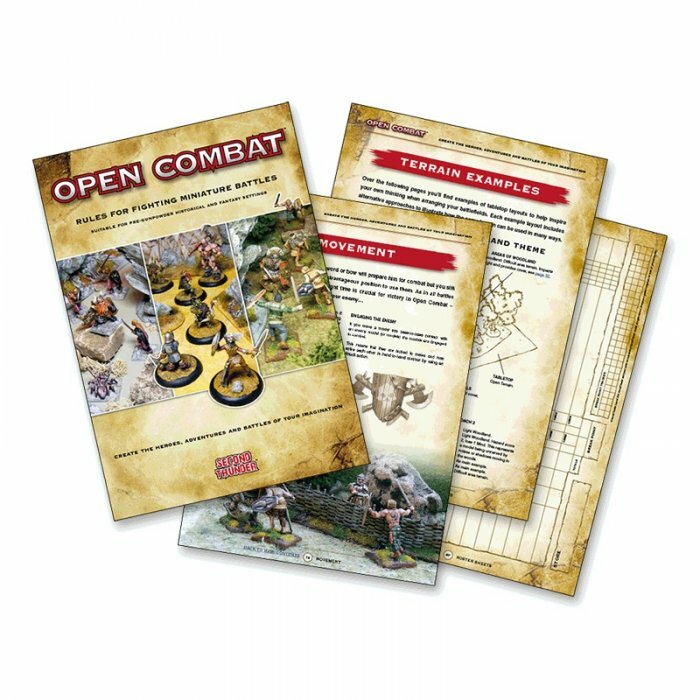 Open Combat is a fast-paced tabletop skirmish game in which you create the heroes, adventures and battles of your imagination. You can guide the ragtag remains of a Roman expeditionary force through barbarian territory, become a Saxon lord with his retinue as they face off against a local rival, or chart the story of a group of adventurers fighting for fortune and glory in a goblin-infested wilderness. It could be anything you wish to play out on the tabletop. • A unique profile and warband construction system which allows you to ‘stat up’ any models you like in any way you wish. All you need is an area of 24”x24”, 3 regular six-sided dice, 3-12 models and 30-60 minutes to play. The Open Combat rules for fighting miniature battles are suitable for pre-gunpowder historical and fantasy settings.